Wallpaper Pack for Windows 8, as the name suggests, is a complete Windows 8 Wallpaper Package that can be downloaded in your Windows 8 desktop at zero cost. The complete package comes up with a total of six different Windows 8 wallpapers including beautiful flowers wallpaper, green leaves wallpaper, landscape, sunset and many more. All the wallpapers available in this package are in high-definition resolution which actually improve the appearance of your Windows 8 desktop. The good part of this Windows 8 wallpaper package is that all the downloaded wallpapers sit back in the “Desktop Wallpaper” option from where you originally select a wallpaper to set as background. Hence, you do not need to put those extra efforts on moving them to the “Desktop Wallpaper” section. It automatically adds into the desktop wallpaper format. Windows 8 Wallpaper is easy to access. You just need to click on a selected wallpaper that you want to set as your Windows 8 desktop wallpaper. Automatically adds to the format of desktop background in “Desktop Wallpaper” section. Do not miss out our post on Windows 8 Snapy App to create slideshows in Windows 8. Click on run to continue the process. 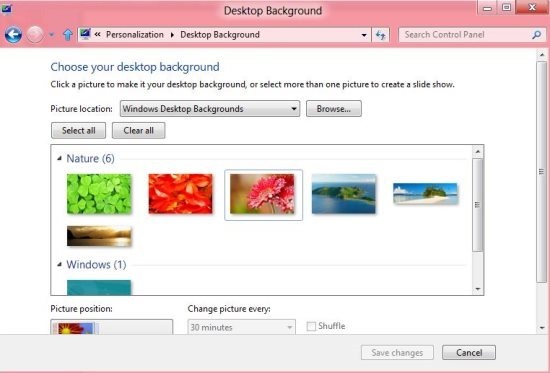 Once you have successfully installed, now check the “Desktop Wallpaper” in the “Personalization” menu, You will find the downloaded wallpapers added into the same section.